A new generation of wearable thermoelectric generators could be a possibility thanks to a new proof-of-concept study by researchers at Georgia Institute of Technology. Their work, based on flexible conducting polymers and novel circuitry patterns printed on paper, has showed thermoelectric generators that can harvest energy from our body heat to power biosensors that measure factors such as heart rate and respiration, or even provide personal electric cooling. As described in the Journal of Applied Physics [Gordiz et al. J. Appl. Phys. (2017) DOI: 10.1063/1.4989589], due to their symmetrical fractal wiring patterns, such devices can be tailored to the required size to offer the voltage and power requirements for particular applications. The benefit of using thermoelectric generator, of course, is that heat is all around us, so if some thermal energy can be harnessed and converted it into electricity cheaply, it could provide a range of useful applications. 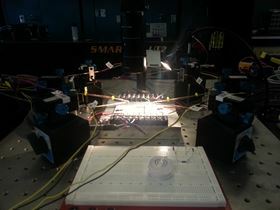 The team had previously developed a framework for evaluating cost-performance metrics of thermoelectrics, applying it to a suite of thermoelectric materials, including polymers. However, there are challenges in that polymers have a low electrical conductivity and low thermopower, and there are few air stable n-type thermoelectric polymers, so they instead developed organic thermoelectric materials and devices. The usual design of such generators is based on inflexible inorganic materials that are too toxic to be involved in wearable devices, while the power output needs a temperature differential from the two sides of the generators, making their use of body heat problematic. Achieving sufficient thermal energy from contact with skin is also difficult, while internal resistance in the device can also constrain the power output. To resolve these issues, the team developed a device with thousands of dots made up of alternating p-type and n-type polymers in a tightly packed configuration. The pattern converts more heat by area because of the large packing densities allowed by inkjet printers. When the polymer dots are positioned near each other, the interconnect length decreases, thereby reducing the total resistance and leading to a higher power output. The wiring patterns used space-filling curves, which allows for surface conformation and self-localization, and therefore a more uniform temperature. Although the devices could power small sensors, they are not expected to produce enough power for more complex devices, such as smartphones. The generators need to be protected from moisture, and it is also key how close they should be to the skin to transfer thermal energy while also being comfortable. The team now hope to demonstrate organic, wearable, printable thermoelectric textiles based on conventional printing and also to weave or knot their own thermoelectric textiles.